Lots of carving, filing and sanding today. This has been one of the most magical parts of the guitar-making journey. To carve a neck, heel block and headstock out of a chunk of wood feels amazing. 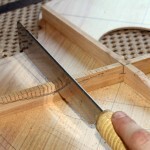 Every scraping, filing, is slowly shaping the wood into your own custom-made neck. You watch it….. become…..
One of the best parts about making a custom-made guitar is that you can create the neck to fit YOUR hands. My hands are quite small (yet they are the same size as Eric Clapton’s, believe it or not). I never took much of a liking to the wide, flat necks of the classical guitar. The narrower necks have always worked in my favour. So I shaped a narrow, thin neck. I got the neck down to about as thin as I could (20mm), without risk of the truss rod piercing through the neck under tension. I also had the opportunity to shape the heel block at the cutaway, and create extra room for the thumb when playing frets right up the neck. I spent all day shaping the neck, making it smooth, symmetrical, ergonomic, comfortable, ideal, Jenny-specific. I used my Maton as a sample, but tweaked bits to allow me more access to the notes right up the neck. The heel block is quite challenging to shape, as it’s in an awkward position, and there’s risk of damaging the sides. I didn’t leave myself much to play with and struggled to get it looking symmetrical. This took ages. My headstock design mimicked the curves of the cutaway, and also the design of the end of the neck, near the soundhole. I’m trying to create a visual unity. These ideas weren’t planned, they just happened over the course of creating. Inevitably, there are gaps between the bindings and the body. Gidgee is very hard to bend, and despite feeling as though I’d put enough pressure on while gluing, there are gaps. Thankfully there weren’t too many. And thankfully it’s an easy fix. The solution is to melt wax, dark in colour like gidgee, into the holes, scrape off, then sand away. You can’t even tell where the gaps were. There are other parts of the guitar like around the rosette, and where the neck joins the guitar, that will need filling, but this will be done with sawdust (Sassafras or Queensland Maple, depending on the area) and glue mix. Startin’ to look like a guitar now. I love the continuity of the line that goes through the finger board to the head stock. A nice detail. It looks great. THANK YOU SPONSORS! Biddle’s Baldies raised over $6000 for the World’s... Day 22: Fretting!